The 1887 N370 Lone Jack Baseball Cards set contains 13 cards measuring 2 1/2" x 1 1/2". Lone Jack Baseball Cards only include players from the St. Louis Browns. The card fronts feature a sepia player portrait, with "Lone Jack Cigarette Co." along the bottom of the card. The backs of the N370 cards are blank and the cards are unnumbered. The lone hall-of-famer to appear in this set is Charles Comiskey. 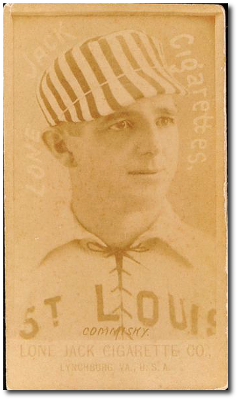 CLICK HERE if you want to sell your 1887 N370 Lone Jack St. Louis Browns Baseball Cards.